To find out which brands are worth gracing your Sunday morning brunch spread, I took a deep dive in the bacon aisle at several supermarkets. Turns out, there’s a lot to choose from. Every big brand seems to have several variations, from thick-cut (which is often not that thick) to the types of wood the bacon is smoked with. To even the playing field, I decided to only test mainstream brands and classic flavors, bringing home several brands to try. There’s so much to like about this bacon, starting with the words “humanely raised” on the label. 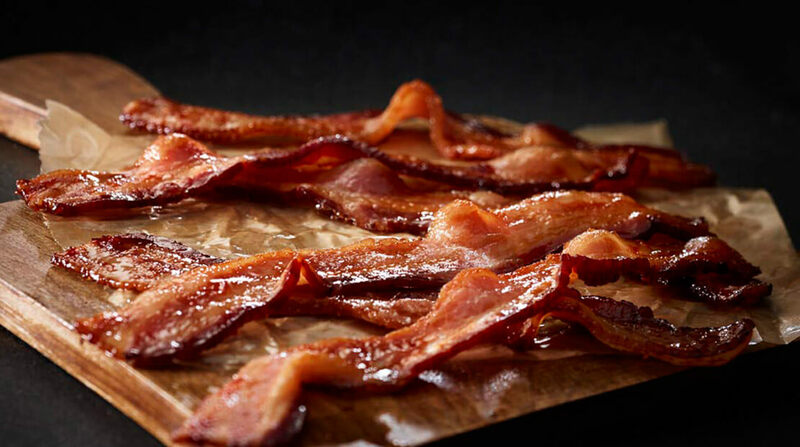 Although the bacon is sliced so thin it’s prone to tearing, it still includes a generous amount of meat. It cooks up super crispy, although it did shrink considerably, which resulted in really skinny strips. Still, it somehow had the richest, deepest flavor of the bunch. It was also the saltiest. It’s not cheap, but for certain things (like bacon, apparently), you have to pay for quality. This is the only bacon I will be buying from now on — I’ll just be sure to get more than one pack when I’m feeding a crowd. The pork behemoth knows how to make good bacon. There’s a generous ratio of meat to fat on each strip, and the bacon cooked up perfectly crisp and evenly browned. The flavor was deeply savory, skewing neither too sweet nor too salty.